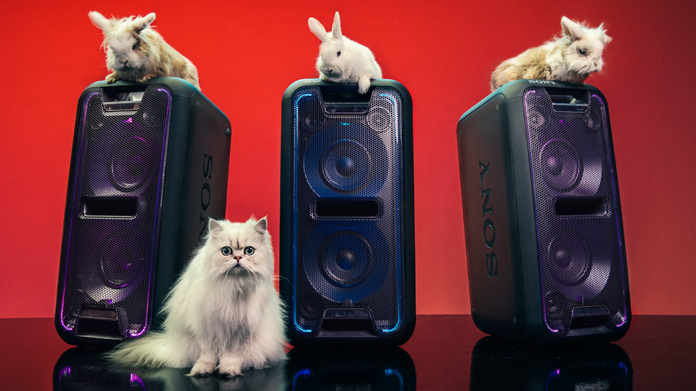 Last year we took on one of our first truly integrated briefs for Sony’s range of HAS or High Powered Audio (or really bloody loud to you and me) speakers. Not only were we asked to look after a consumer PR campaign that took the range beyond the tech and audio media, but were also given the remit to come up with content that would work across the brand’s social channels, paid social and, in the end, its above the line and in-store. The result was our first true ad for the brand – Sony x Cymatics. Well this year we once again embraced the challenge as a similar brief arrived for the latest range. Using our originally conceived strategy for the range – that they create “sound so loud you can see it” – we set out about trying to capture the almost visceral sense you get from using one of the speakers. Naturally, we turned to animals. Party animals in this case. A happy two day shoot later and the film below was the result, a cracking partnership between the creative team at Hope&Glory (James Gordon-MacIntosh, Mike Levaggi) and Cole Paviour and his team at production company Unit9. The film has been picked up in over 200 pieces of coverage across Europe, been seen several tens of thousands of times and was also given honourable mentions across the likes of Creativity, AgencySpy, The Stable, CreativePool, Campaign and Shots. Which was nice.